In my last post I gave you some tips for reading picture books to children. In that post I mentioned that when children know the authors and illustrators of the books being read to them, they can begin to have some favorites. And I said that I had some favorites myself. Let me introduce you to my one of my favorite author/illustrator of children’s picture books. Yes, this man both writes and illustrates his books which are loved by children and adults alike! Meet Kevin Henkes. I love the books that Kevin Henkes writes because they are frequently about situations that can be familiar to children. He often sets up the problem and then brings the book to a close with a satisfying solution. The emotions are very true and believable and children can identify with them easily. Many of Kevin Henkes’ characters are adorable little mice. He also brings characters, such as Lilly (of the purple plastic purse fame!) back for additional adventures. A life lesson is usually part of the story, but told in a way that is not heavy handed. Here are some of my favorite Kevin Henkes’ books. When you read these picture books I think you’ll understand why he tops my list of favorite authors for young children. 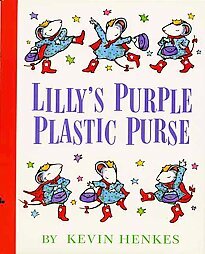 Lilly’s Purple Plastic Purse – Lilly takes a new and prized possession to school, but looses it to the teacher when she does not follow his instructions. Her strong emotions and reaction create a problem that she eventually fixes. Lilly’s Big Day – When her teacher gets married, Lilly wishes with all her heart to be the flower girl. Her disappointment and then resolution of her feelings make this story, with a twist at the end, truly heartwarming. Julius, Baby of the World – Again Lilly is the main character as the older sister who is not fond of her new baby brother. Her loyalty and love come to the forefront when a visiting cousin insults baby Julius. Many an older sibling can relate to this story, I am sure! Owen – A little mouse must give up his beloved blanket before he goes to school. The futile attempts by his parents are comical and the sweet solution to the problem at the end of the story is very satisfying. Children will most likely relate to Owen’s discomfort and cheer for him at the end of the story. Chrysanthemum – A little mouse loves her name until children at school tease her for being named after a flower. Her sadness resolves when the lovely music teacher validates the name at school. Again, typical child behavior and emotions make this story one with a strong message about acceptance and kindness. Chester’s Way – A pair of mice are best friends and believe that the way they do things is the best. Chester’s way is always Wilson’s way, too. But the boys have a change of heart when they meet Lilly and realize there is another way to do things and another friend to be made. Sheila Rae, the Brave – Sheila Rae, another adorable mouse character, is very brave until she gets lost taking a new way home from school. Her younger sister, Louise, comes to her rescue and solidifies a lovely sibling relationship. Wemberly Worried – This little mouse is as big worrier. Children will smile at the silly things that concern her. When she meets another shy child, her worries evaporate! Children who tend to worry will fine humor in this story and will see Wemberly become confident in the end. Kitten’s First Full Moon – This story is a departure from the elaborate mouse tales and tells the story of a kitten who believes the moon is a bowl of milk that she just can’t seem to reach. My four-year-old grandson loves knowing what the kitten does not – that the bright white circle is the moon. He sounds like a great author. Thanks for sharing this! I'll have to see if my local library has any of these books. Thanks for the recommendation. I was planning about launching a day care business in nearest time, this book could be useful. Thanks for visiting my blog the other time. Glad to see you there.